Objective: The aim of this study was to determine normal values for fetal left ventricular (LV)-myocardial performance index (MPI) in Indian population and to assess its relation to advancing gestation and fetal heart rate (FHR). Materials and Methods: Two hundred pregnant women without any pregnancy-related complications and whose fetuses were shown to have structurally normal hearts were enrolled in this study. Doppler waveform involving simultaneous display of mitral inflow and LV outflow was obtained in all. Various intervals including isovolumetric contraction time (IVCT), isovolumetric relaxation time (IVRT), and ejection time (ET) were measured and then the MPI was calculated using the formula IVCT + IVRT/ET. Also the correlation between MPI and gestation age and FHR was assessed. We also reviewed the literature on the use of MPI for the assessment of fetal LV function. Results: The normal MPI in second and third trimester fetuses of Indian population was 0.42 ± 0.03. The mean IVCT was 33 ± 4 milliseconds (ms), mean IVRT was 39 ± 5 ms, and mean ET was 169 ± 9 ms. The mean heart rate was 148 ± 8 bpm and the mean PR interval was 111 ± 10 ms. There was no significant association of LV-MPI with either FHR or advancing gestation. Conclusion: MPI is a useful parameter for the assessment global cardiac function. MPI has the advantage of not being affected by FHR, ventricular size, and geometry or image quality. The review of literature shows its significant importance in monitoring complicated pregnancies. The field of fetal cardiology has advanced significantly in the past few decades. From the initial use of fetal echocardiography for cardiac anatomy delineation in fetus by Dolkart and Reimer  who documented the normal cardiac anatomy of 52 second and third trimester fetuses. Echocardiography is now used for fetal cardiac anatomy, function, and hemodynamic assessment. Doppler technique is being increasingly used for the functional assessment of the fetal heart. The systolic function has been assessed by various parameters such as ventricular fractional shortening or ejection fraction measured by Simpson's technique. However, the reproducibility of these measurements were poor due to fetal movements or inadequate images. Diastolic function is being assessed by pulsed Doppler of ventricular inflows, IVC, ductus venosus, or umbilical vein. An alteration of the velocity or waveform at these sites was an indicator of cardiac dysfunction with imminent heart failure. However, these parameters are often a late marker of ventricular dysfunction. Recently, there has been particular interest in fetal myocardial performance index (MPI or Tei index) as it gives an evaluation of both systolic and diastolic ventricular functions. In fetus though cardiac failure is less common, implementation of this technique helps in identifying subtle changes in cardiac function in subclinical phase. This in turn helps in identifying the high-risk population and their subsequent management. MPI is a combined index of global myocardial function and it is independent of ventricular size, geometry, and heart rate. It may get affected by preload. MPI is being increasingly used in pediatric echocardiography. However, its use in fetal cardiac assessment is limited probably because of lack of normal value ranges and awareness of its significance in various fetal conditions. This study was done to determine the normal values for fetal left ventricular (LV)-MPI in second and third trimester fetuses of Indian population. This is a prospective study involving 200 healthy pregnant women with singleton pregnancy whose fetuses were shown to have a normal echocardiogram. These women were referred for fetal echocardiography either due to a family history of heart disease or due to some abnormal finding on routine level-two ultrasound. 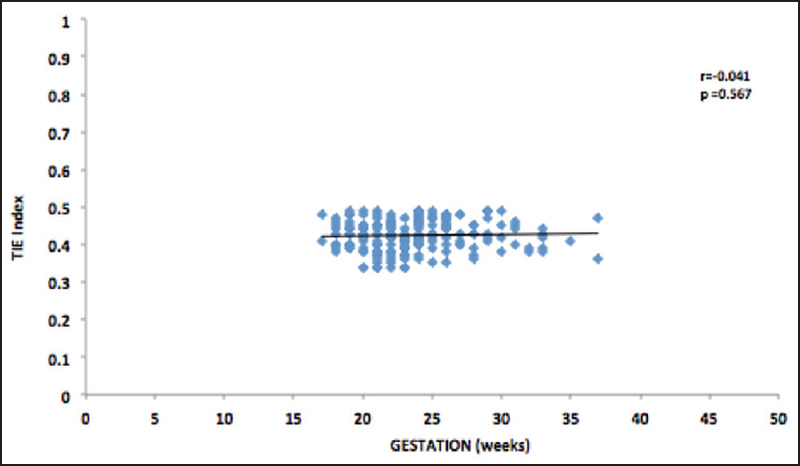 The mean gestational age was 24 ± 3.9 weeks (range 17-37 weeks). The exclusion criteria included women with pregnancy-associated complications such as preeclampsia, diabetes, or intrauterine growth restriction as well as women whose fetuses were diagnosed to have significant structural anomaly. Two-dimensional fetal echocardiography was performed using the C5-2 curved array transducer and iE33 imaging system (Philips Healthcare) and all images were recorded. For Doppler measurements, the Doppler gate was kept at the minimum size (1 mm) and the angle of insonation was kept below 30°. Faster sweep were used to better define the intervals and gains were kept low. For calculation of MPI, a gated pulsed Doppler sample volume was placed in the left ventricle at the junction of the anterior mitral leaflet and the LV outflow tract in an apical five-chamber view. The following time intervals were measured: Isovolumetric contraction time (IVCT) was measured from the end of the mitral A wave to the onset of the aortic pulsed Doppler tracing, ejection time was measured from the onset to end of the aortic pulsed Doppler tracing, and isovolumetric relaxation time (IVRT) was measured from end of aortic pulsed Doppler tracing to the onset of mitral valve E wave. Three successive measurements of all the parameters were obtained and MPI was calculated from the average of each interval using the formula: MPI = IVCT + IVRT/ET. Fetal heart rate (FHR) and PR interval were also measured. A single observer made all the measurements. Statistical Package for the Social Sciences (SPSS) software (SPSS-Inc., Chicago, IL) was used for the statistical analysis. All numeric data are expressed as mean ± SD. Linear regression analysis was used to evaluate the relationship of the MPI and other parameters to gestational age and heart rate. Statistical significance was defined as P< 0.05. Two hundred pregnant women with single, normal healthy fetuses were enrolled in this study [Table 1]. Fetal IVCT, IVRT, ET, HR, PR interval, and mitral valve inflow E and A velocities were measured in all fetuses [Table 2]. Mean IVCT was 33 ± 4 milliseconds (ms), mean IVRT was 39 ± 5 ms, and mean ET was 169 ± 9 ms. The mean heart rate was 148 ± 8 bpm and the mean PR interval was 111 ± 10 ms. The mean MPI was 0.42 ± 0.03. 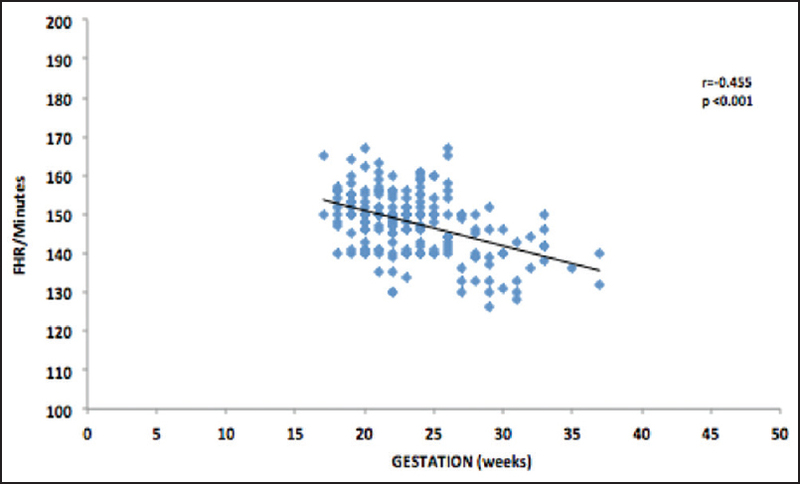 The correlation coefficient analysis revealed no correlation between MPI and the gestational age (R = 0.04) [Figure 1]. 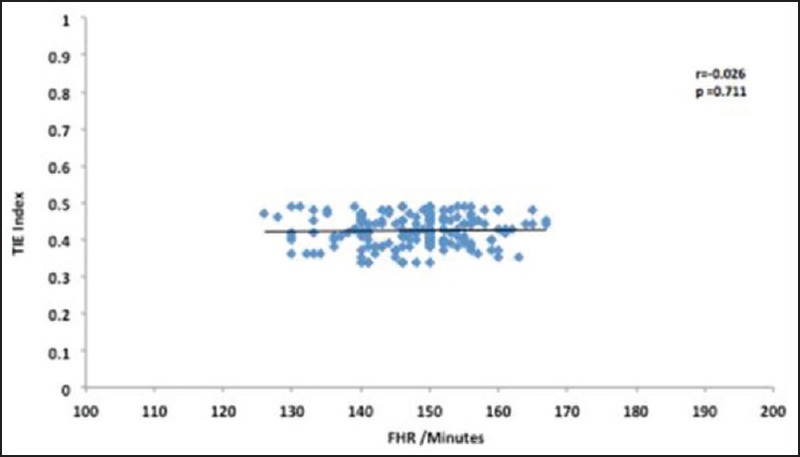 Also there was no correlation between MPI and the FHR [Figure 2]. However, there is a definite correlation of FHR and the mitral valve inflow E/A wave velocity ratio with gestational age. FHR decreased with advancing gestation [Figure 3] (r = 0.455, P< 0.001) while the mitral valve inflow E/A ratio increased with advancing gestation [Figure 4] (r = 0.28, P< 0.001). Our knowledge to assess fetal cardiac function and to predict potential progression to dysfunction is still evolving. The correct assessment of fetal myocardial function is of critical importance while evaluating high-risk fetuses. Early recognition of subtle changes in myocardial performance may be potentially lifesaving for the fetus and helpful in timing the delivery appropriately. The IRT component of MPI is the most important, its derangement indicates a reduced calcium uptake and reduced cardiac function and is the earliest to get affected in diseased states. Multiple studies have been done to determine the normal values of MPI in the fetus [Table 3] and establish its potential clinical application but with varied results. Tsutsumi et al. were the first to use TEI index for the assessment of fetal global myocardial function. They reported a LV-MPI of 0.62 ± 0.07 (18-26 weeks fetuses) and also reported a fall in MPI values to 0.43 ± 0.03 beyond 34 weeks of gestation. According to them, LV myocardial maturational changes accelerate after the late gestation and the changes in global ventricular function are related to these maturational changes. Similar negative correlation of MPI with advancing gestation was also reported by Chen et al. In contrast to this, Friedman et al. reported that the MPI values did not show any significant correlation with gestational age and heart rate. Similar finding were reported by Parasuraman et al. and Russel et al. Our study has also shown that the MPI has no correlation with either gestational age or heart rate. The technique of MPI measurement has also evolved. Initially the time intervals were measured in separate inflow and outflow pulsed Doppler signals. Subsequently, Friedman  introduced the measurement of intervals from a single pulsed Doppler recording with simultaneous display of normal LV filling and emptying which was obtained by placing the sample volume at the junction of the anterior mitral valve leaflet and the LV outflow in an apical five-chamber view. Hernandez et al. introduced a new approach to measure the time intervals by using the Doppler echos of mitral and aortic valve clicks reported that this technique had lesser intra- and interobserver variation. We had however used the technique described by Friedman. MPI has been proven to be useful in monitoring the cardiac status in various diseased states of the fetus such as intrauterine growth retardation (IUGR), twin-twin transfusion syndrome (TTTS), fetus of diabetic mother, and fetal inflammatory response syndrome (FIRS) in fetuses with preterm premature rupture of membranes. MPI is also helpful in determining the prognosis. Various fetal disease states and the role of MPI are described in [Table 4]. Developments in the technique of image acquisition and definition of ultrasound settings have substantially improved the reproducibility of measurements since its proposal. Several single-center studies have previously evaluated the MPI in complicated pregnancies; however, large multicenter studies using standardized machine settings and technique are still required to evaluate the effect of pathology on the fetal MPI values. A consensus must be reached and universal normal reference ranges should be established to accurately assess the effect on MPI values in complicated pregnancies. The possibility of intraobserver errors cannot be excluded from the study since all the observations were made by a single operator. Our study gives the normal range of MPI in normal fetuses of Indian population and also shows that MPI is independent of gestational age and FHR. Thus, MPI should be used for the initial assessment of the global cardiac function in normal fetuses and fetuses with congenital heart defects as well as for the follow-up of fetuses with cardiac defects. MPI is also potentially useful for the evaluation of the fetal cardiac status in noncardiac disease states. Dolkart LA, Reimers FT. Transvaginal fetal echocardiography in early pregnancy: Normative data. Am J Obstet Gynecol 1991;165:688-91. Simpson J. Echocardiographic evaluation of cardiac function in the fetus. Prenat Diagn 2004;24:1081-91. 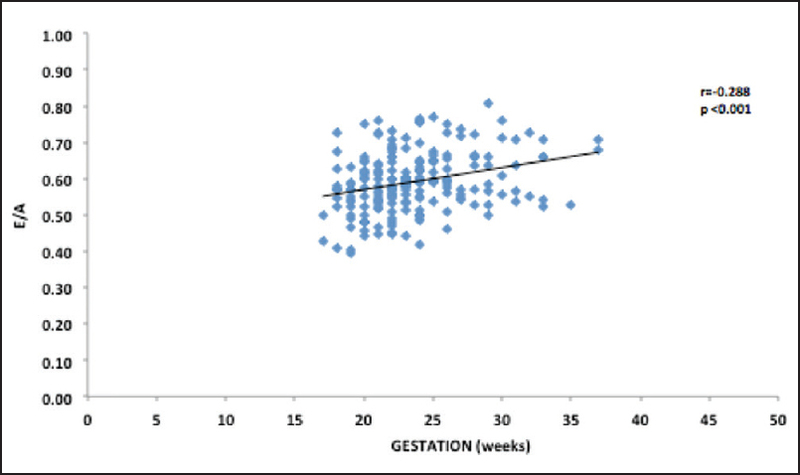 Parasuraman R, Osmond C, Howe D. Gestation-specific reference intervals for fetal cardiac Doppler indices from 12 to 40 weeks of gestation. J Obstet Gynaecol Res 2012;38:160-4. Tsutsumi T, Ishii M, Eto G, Hota M, Kato H. Serial evaluation for myocardial performance in fetuses and neonates using a new Doppler index. Pediatr Int 1999;41:722-7. Friedman D, Buyon J, Kim M, Glickstein JS. Fetal cardiac function assessed by Doppler myocardial performance index (Tei index). Ultrasound Obstet Gynecol 2003;21:33-6. Eidem BW, Edwards JM, Cetta F. Quantitative assessment of fetal ventricular function: Establishing normal values of the myocardial performance index in the fetus. Echocardiography 2001;18:9-13. Ghawi H, Gendi S, Mallula K, Zghouzi M, Faza N, Awad S. Fetal left and right ventricle myocardial performance index: Defining normal values for the second and third trimesters-single tertiary center experience. Pediatr Cardiol 2013;34:1808-15. Chen Q, Sun XF, Liu HJ. Assessment of myocardial performance in fetuses by using Tei index. Zhonghua Fu Chan Ke Za Zhi 2006;41:387-90. Hernandez-Andrade E, Benavides-Serralde JA, Cruz-Martinez R, Welsh A, Mancilla-Ramirez J. Evaluation of conventional Doppler fetal cardiac function parameters: E/A ratios, outflow tracts, and myocardial performance index. Fetal Diagn Ther 2012;32:22-9. Russell NE, McAuliffe FM. First-trimester fetal cardiac function. J Ultrasound Med 2008;27:379-83. Hernandez-Andrade E, López-Tenorio J, Figueroa-Diesel H, Sanin-Blair J, Carreras E, Cabero L, et al. A modified myocardial performance (Tei) index based on the use of valve clicks improves reproducibility of fetal left cardiac function assessment. Ultrasound Obstet Gynecol 2005;26:227-32. Stirnemann JJ, Mougeot M, Proulx F, Nasr B, Essaoui M, Fouron JC, et al. Profiling fetal cardiac function in twin-twin transfusion syndrome. Ultrasound Obstet Gynecol 2010;35:19-27. Quintero RA, Morales WJ, Allen MH, Bornick PW, Johnson PK, Kruger M. Staging of twin-twin transfusion syndrome. J Perinatol 1999;19:550-5. Papanna R, Mann LK, Molina S, Johnson A, Moise KJ. Changes in the recipient fetal Tei index in the peri-operative period after laser photocoagulation of placental anastomoses for twin-twin transfusion syndrome. Prenat Diagn 2011;31:176-80. Letti Müller AL, Barrios Pde M, Kliemann LM, Valério EG, Gasnier R, Magalhães JA. Tei index to assess fetal cardiac performance in fetuses at risk for fetal inflammatory response syndrome. Ultrasound Obstet Gynecol 2010; 36:26-31. Bhorat IE, Bagratee JS, Pillay M, Reddy T. Use of the myocardial performance index as a prognostic indicator of adverse fetal outcome in poorly controlled gestational diabetic pregnancies. Prenat Diagn 2014;34: 1301-6. Figueroa H, Silva MC, Kottmann C, Viguera S, Valenzuela I, Hernandez-Andrade E, et al. Fetal evaluation of the modified-myocardial performance index in pregnancies complicated by diabetes. Prenat Diagn 2012;32:943-8. Benavides-Serralde A, Scheier M, Cruz-Martinez R, Crispi F, Figueras F, Gratacos E, et al. Changes in central and peripheral circulation in intrauterine growth-restricted fetuses at different stages of umbilical artery flow deterioration: New fetal cardiac and brain parameters. Gynecol Obstet Invest 2011;71: 274-80. Nassr AA, Youssef AA, Zakherah MS, Ismail AM, Brost BC. Clinical application of fetal left modified myocardial performance index in the evaluation of fetal growth restriction. J Perinat Med 2015;43:749-54.